Ok, so I have to say that I am a little disappointed with what I am about to write but I gotta give y’all the truth! A few months ago I received a sample of DevaCurl No-Poo (that means no lather. Weird…I know!) Shampoo and One Conditioner in my Birchbox. Now, I know you ladies must have seen the late night/early morning Wen hair care products infomercial. You know, the one that was created by some guy named Chaz who has maybe had one too many filler and Botox sessions if you ask me and totally needs a hair cut? Well, it’s the same idea as that stuff. 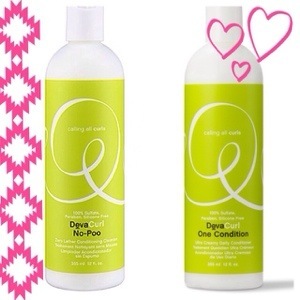 No lather shampoo that helps with the hydration of your hair. I mean I get the concept, shampoos that lather strip your hair of natural oils blah, blah, blah. I was totally for it after using my Birchbox sample but now that I have been using the full size product for a couple of weeks, I am sad to say that I am no longer a fan (insert major sad face). So here’s the deal. Yes, I did feel like my hair was more hydrated after using the no-poo shampoo but I also feel like it weighed my hair down and made it feel and look like I had a film coating my hair when it was dry. I even made sure to spend extra time rinsing to make sure it wasn’t left over product . The conditioner was enjoyable because it smells like purple pixie sticks. Why I find that enjoyable? I have no idea but I do. Anyways, I also found that styling my hair was a biz-natch. It was frizzy and weighed down. It wouldn’t hold curl which if you know me, you know that is a big problem for my life. I curl my hair every day! So, I unfortunately would not really recommend this product unless. It may be good for super curly haired girls, which is what is was made for in the first place, so give it a try curly haired girls! Maybe it will work better for you than me.